They were active in the late 1980s to early 1990s publishing sports-based management games. Not to be confused with the video game publisher Goliath Games. 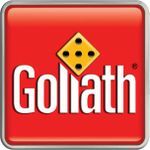 In 2014 Goliath Games B.V. was acquired by Pressman Toy Corp.